So, last night I had some friends over for dinner (and learned that if you are going to have appetizer, soup, pasta, salad, and dessert – which is cheesecake – it really is quite all right to spread dinner out into a 5-hour experience), and then checked my internets before tumbling into bed (thank you daylight savings for the extra hour OMG), and I had a few comments in my inbox letting me know that, hey! November Magknits had arrived! And well would ya lookie there, I’m in it! I knew it was going to happen, but I’d somehow managed to misfile that information in my brain and so now it is sort of a pleasant surprise. Thanks, Magknits! I used Plymouth Wildflower DK because it was accessible to me at the time and it came in a wide range of colours, but really, just about any DK yarn that maintains its integrity pretty well (i.e. that will not droop too horribly) would work just fine. A note on yarn selection: if you intend this sweater to be machine-washable-dryable, make sure you wash and dry your swatch beforehand so that you get an idea of how the finished fabric will behave afterwards. Some machine-washable-dryable yarns do actually shrink up slightly post-drying, which makes it desirable to knit a few extra rows in key places so that the shaping still sits where you want it to sit. I suspect that knitters will also want to make adjustments depending on their height; for example if you are quite petite, even a 12-inch sleeve might not be quite cropped enough, or if you are particularly on the tall side you may want some extra length pre- and post-waist-shaping, so get out the measuring tape and see what works best for you. Congrats! I love it! I cannot wait until I am able to do this advanced stuff. I am hoping I have the ability to be half as talented as you, as well as some of these other talented bloggers! yay it’s finally up! congratulations! OMG, I LOVE it!! I want to cast on for one right away, like today. Usually with sweaters I mull and mull and mull and hardly ever get around to making them, but I have all this DK yarn waiting for the right project, and there’s something about the deep V and 3/4 sleeves that just looks right. So I’ll get to this very soon. Congratulations on another published pattern, Glenna! Congrats! What a wonderful sweater! Love the cropped sleeves. Congrats! Hee, I looked at the new Magknits yesterday and saw your pic and went HAY I RECOGNIZE HER! It’s a fabulous basic sweater. Anything that is smaller than a sweater doesn’t really count in the oh-I-shouldn’t-cast-that-on-since-I’ve-got-this-and-this category does it – socks, hats, gloves, small animals… totally up for grabs at anytime! Glenna! You’ve designed my ideal cardigan! How did you know??? Kidding. Seriously, this is now in my queue. Thanks! And congratulations! I love it! It’s exactly the kind of elegant, classic knit that I crave these days. It will definitely be going into my queue of things to knit. Thanks for a lovely design! Congratulations! I LOVE that cardi! I’ve saved the pattern (THANK YOU!!!) and it really is… the ideal little cardi! It looks great. And the color too! I already have posted progress pics of this sweater. *laugh* I fell in love. I love Basic Black and I already have some yarn in my stash that would be great for it. I think I’ll be making one in time for spring. I saw the new MagKnits while at the boy’s apartement, and he was quite confused by my sudden jumping up and down and pointing at the computer screen “This! This is what I need!!”. 😀 Thanks so much Glenna for that wonderful pattern – I was beginning to give up finding a suitable pattern for the Felted Tweed I have, but this might just work! And it’s so wonderfully simple, too! I love that there’s waist-shaping in the cardigan as well. Well done! 🙂 I love it!! It’s beautiful! Looks so wearable. I can’t wait to see how fast this is in everyone’s ravelry queue!! My to-knit list in a mile long, but I think I’ve got to add it!! It is gorgeous! And it fits so well! I don’t have any experience with these kind of “fitted” sweaters. Do you recommend to knit it with a bit of negative ease? Is yours a bit smaller than your bust size or did you knit it exactly to your bust size? I really would like to knit one for my self! Awesome sweater! A great wardrobe staple! Congrats! Great pattern! I have some purplish yarn that might work… I’m one of your lapsed Ivy KALers (just need to finish seaming! ), but from that experience, I know your patterns are well written and fit. Thanks for another great one! I’ve already made a Koolhaas from the Holiday Knits. It took about 2 football games, so pretty quick. I’ve been eyeing the tam too. A beautiful classic design! Definitely the type of sweater that you would get lots of wear from. Thanks! I really like the style of your sweater. Nicely done. Glenna, I saw that at magknits yesterday and it is so nice to see a pattern for a basic knit that just goes woth everything, so thank you! I LOVE the sweater! It’s going on my list of things I must knit! It’s an absolutely gorgeous shape and looks totally fabbo on you! Who needs pizazz? I think the simple designs are so often the best. Good on ya, girl! I love the sweater! Classic. The type of thing that can be worn in public more than 1 season without scaring the fashion police. Woot! It’s gone in my queue to be knit. Awesome pattern! Thank you 🙂 and yeah its in Wildflower DK – I love that stuff…soft…usable….and washable. Oh yup…fiber…spinning its addictive. I lasted one weekend with a drop spindle – felt oh so proficient at making yarn. Enough to proclaim to my husband that I now need a spinning wheel. Its instant gratification – fluffy goodness to squishy yarn to yummy socks, mitts, sweater. Happy spinning and kniting! congrats!!! that is a great sweater pattern – I’m all for the basics!!! I love the sweater and have definitely added it to my list of things to knit after Christmas. Thanks for another great pattern! Congrats on the pattern! 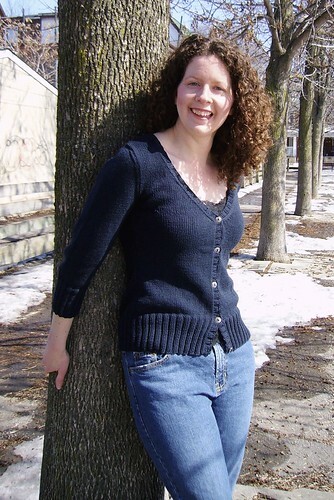 It’s great –definitely another Glenna pattern for ol’ Ravelry queue! Awesome pattern, Glenna! I cast on in Shine Sport, Orchid over Thanksgiving. This will be my first adult sized sweater. Fingers crossed, but the first part of the back looks really nice; I am half way through the first decrease section. You’re right about it not being too intimidating, but it still is very nice and interesting. I’ll keep you posted when it is finally done. Thanks again!! Um, I realize that I’m way late, but I was wondering if there was a way to find this pattern anywhere? I’d really like to knit it, but I couldn’t find a working link on Ravelry. You know what, I’m really stupid. I’m sorry. Disregard that previous comment.